Augmented reality (AR) has a great potential in creating rich user interfaces where users can view and interact with virtual objects. AR can have both passive objects and active objects. The former do not respond to interaction; the latter can be altered in their orientation, shape and position in relation to other virtual objects, for example. Remote laboratories (RLs) enable access to equipment and experiments via the Internet. This chapter focuses on the use of virtual objects in remote laboratories as an alternative, immersive user interface. Having an AR environment allows users to interact with experiments as virtual objects enabling hands-on experiences. This is made possible by using specialised natural user interface (NUI) devices. These devices can capture the natural movement of users and apply them to virtual objects. This chapter considers the role of AR and NUIs in the context of remote laboratories. It provides the context for AR and NUIs and discusses examples of systems that can be used. It demonstrates how users can interact with remote laboratories in these environments. NUI is part of the curriculum at the undergraduate level. 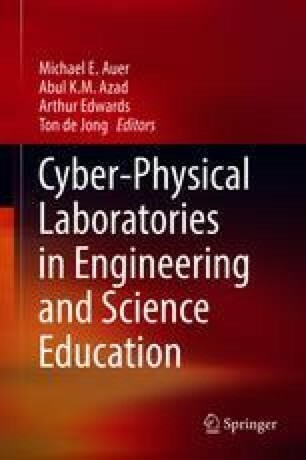 This cyber-physical environment provides an ideal context to teach human-computer interaction (HCI). The first two sections of this chapter describe AR and using NUI in the RL environments. The last section introduces a practical example of using NUI and RL to teach HCI. Müller, D. (2009). Mixed reality systems. International Journal of Online Engineering (iJOE), 5(S2). https://doi.org/10.3991/ijoe.v5s2.1098.